In music, variation is a formal technique where material is repeated in an altered form. The changes may involve melody, rhythm, harmony, counterpoint, timbre, orchestration or any combination of these. A complete performance can be heard by following this link: Listen. 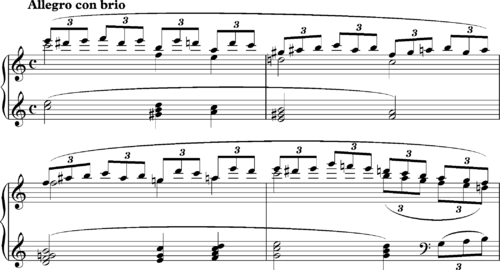 Phrase and variation from Chopin's Nocturne in F minor. According to Nicholas Cook, in Geminiani's version "all the notes of Corelli's violin line ... are absorbed into a quite new melodic organization. With its characteristic rhythmic pattern, Geminiani's opening is a tune in a way that Corelli's is not... whereas in the original version the first four bars consist of an undifferentiated stream of quarter-notes and make up a single phrase, Geminiani's version has three sequential repetitions of a distinctive one—bar phrase and a contrasted closing phrase, producing a strongly accented down-beat quality." Jazz arrangers frequently develop variations on themes by other composers. For example, Gil Evans’ 1959 arrangement of George Gershwin's song "Summertime" from the opera Porgy and Bess is an example of variation through changing orchestral timbre. At the outset, Evans presents a single variation that repeats five times in subtly differing instrumental combinations. These create a compelling background, a constantly-changing sonic tapestry over which trumpeter Miles Davis freely improvises his own set of variations. Wilfrid Mellers (1964) wrote that "[i]t called for an improviser of Davis's kind and quality to explore, through Gil Evans' arrangement, the tender frailty inherent in the 'Summer-time' tune... Between them, solo line and harmonic colour create a music that is at once innocent and tense with apprehension". Variation forms include ground bass, passacaglia, chaconne, and theme and variations. Ground bass, passacaglia and chaconne are typically based on brief ostinato motifs providing a repetitive harmonic basis and are also typically continuous evolving structures. 'Theme and variation' forms are, however, based specifically on melodic variation, in which the fundamental musical idea, or theme, is repeated in altered form or accompanied in a different manner. 'Theme and variation' structure generally begins with a theme (which is itself sometimes preceded by an introduction), typically between eight and thirty-two bars in length; each variation, particularly in music of the eighteenth century and earlier, will be of the same length and structure as the theme. This form may in part have derived from the practical inventiveness of musicians; "Court dances were long; the tunes which accompanied them were short. Their repetition became intolerably wearisome, and inevitably led the player to indulge in extempore variation and ornament"; however, the format of the dance required these variations to maintain the same duration and shape of the tune. Chopin's Berceuse for piano, Op. 57, was first called Variantes, and consists of 16 continouos variations on a ground bass. Graham Waterhouse composed a trio Gestural Variations in 1997, and Helmut Lachenmann composed a trio Sakura-Variationen on the Japanese song in 2000. Skilled musicians can often improvise variations on a theme. This was commonplace in the Baroque era, when the da capo aria, particularly when in slow tempo, required the singer to be able to improvise a variation during the return of the main material. During this period, according to Nicholas Cook, it was often the case that "responsibility for the most highly elaborated stage in the compositional process fell not upon the composer but upon the executant. In their instrumental sonatas composers like Corelli, Geminiani, and Handel sometimes supplied the performer with only the skeleton of the music that was to be played; the ornamentation, which contributes crucially to the music’s effect, had to be provided by the performer." Cook cites Geminiani's elaboration of Corelli (see above) as an example of an instance "in which the composer, or a performer, wrote down a version of one of these movements as it was meant to be played." ^ Mellers, W. (1983, p. 386) Beethoven and the Voice of God. London, Faber. ^ Cook, N. (1990, p.189) Music, Imagination and Culture. Oxford, Clarendon Press. ^ Cook, N. (1990, p.190) Music, Imagination and Culture. Oxford, Clarendon Press. ^ a b c Sisman 2001. ^ Hodeir and Pautrot 2006, 8. ^ a b White 1976, 64–65. ^ "American Symphony Orchestra: Dialogues and Extensions". Archived from the original on 2009-03-05. Retrieved 2008-12-21. ^ See Donald M. McCorkle, p. 5 in the Norton Scores edition of the Variations (ISBN 0-393-09206-2). ^ Gamble, T. (1984, p13) "Imagination and Understanding in the Music Curriculum", British Journal of Music Education, Vol. 1, No. 1. Cambridge University Press. ^ Lewis, J. (2011) “Coleman Hawkins records Body and Soul: Number 14 in our series of the 50 key events in the history of jazz music.” Guardian, 17 June. Austin, William. 1966. Music in the 20th Century. London: Dent. Mellers, Wilfred. 1964. Music in a New Found Land: Themes and Developments in the History of American Music. London: Barrie and Rockliff. This page was last edited on 4 February 2019, at 15:09 (UTC).